When Dylan and I went to the store today to pick out a beer to go in these cupcakes, we weren’t quite sure what we were going to use. 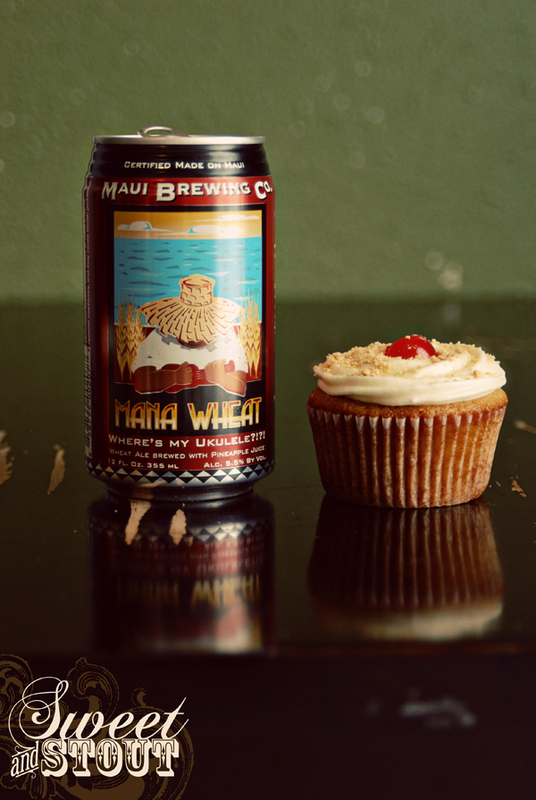 Then we found a beer called Mana Wheat, from the Maui Brewing Company. It’s a wheat beer and it’s brewed with pineapple juice! I can’t see there being another beer that would be better suited for this cake. The beer is light bodied with a crisp pineapple taste to it, and not in an overpowering, or overly sweet kind of way. I’ve got another can in the refrigerator waiting for me, it’d be perfect on a bright sunny day. The cake is basically a yellow cake with crushed pineapple added to it (and beer, of course). The crushed pineapple keeps the cake moist, and I think the beer flavor comes through really nicely in this one. My original plan for the frosting was to make the pie filling, like my mom used to make. 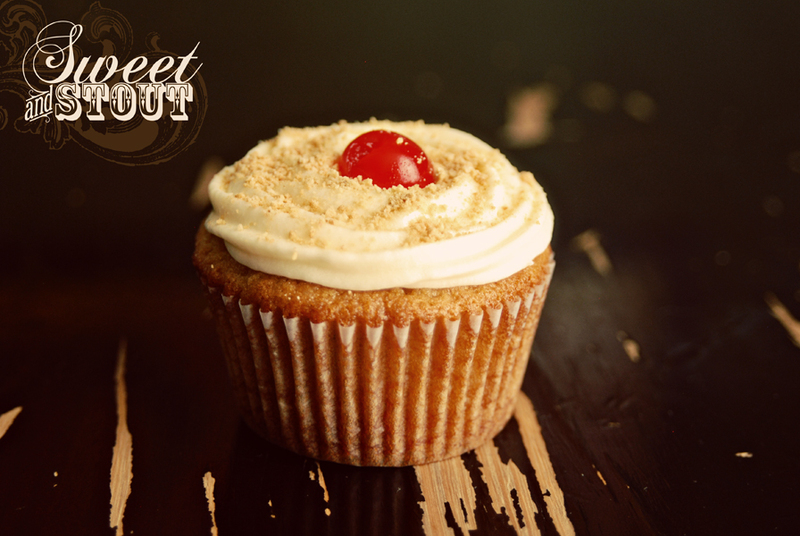 Since we’re going to be offering samples of this cake tomorrow evening at the foodie tweetup (are you going? ), I wanted a frosting that wouldn’t melt after being out of the refrigerator for a short time, like a whipped topping might do. I used a cream cheese frosting instead, and flavored it with pineapple juice. It turned out delicious! 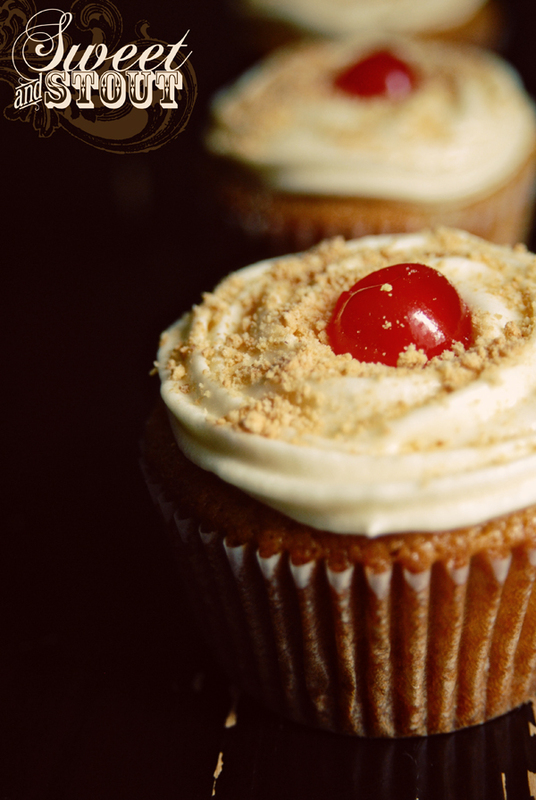 After frosting a bunch of mini cupcakes, and a few full size ones, each is topped off with a dusting of graham cracker crumbs and half a maraschino cherry. We are looking forward to seeing you at Launchpad on Monday evening for the tweetup! We won’t be there right at 5 pm when it starts (have to work the day job until 5 pm), but we’ll see you soon after. Preheat oven to 350 degrees, put cupcake liners in cupcake pan. Beat butter with electric mixer until creamy. Add sugar gradually, 1 cup at a time and blend well. Add eggs 1 at a time and mix well between each addition. Combine 1/2 cup pineapple juice and 1/2 flavored beer in a small bowl or measuring cup. (If you don’t have pineapple juice, you could just use a full cup of beer) Set aside to be used in next step. Add flour to butter mixture alternating with beer/pineapple juice mixture. Begin and end with flour. Stir in vanilla extract, for added coconut flavor in the batter you could add 1 tsp coconut extract, but not necessary. I added coconut flakes in the frosting to get more of the coconut flavor to come out. Scoop batter into cupcake papers by 1/3 cup. Batter should fill cupcake paper about 2/3 of the way. Bake at 350 degrees for 25-30 minutes, let rest in pan a few minutes before removing to cool. Add powdered sugar, 1 cup at a time and blend well in between additions. Add vanilla & coconut rum, blend well. Add more powdered sugar until desired consistency is achieved. Frost cupcakes when cooled. 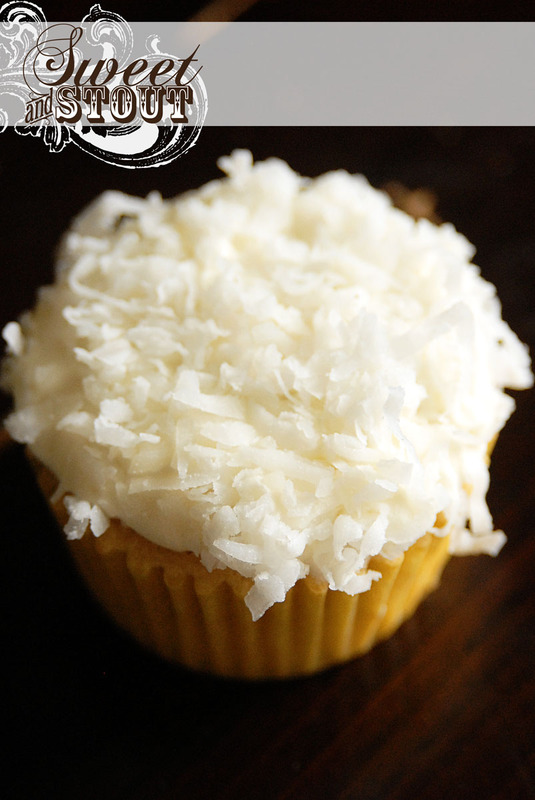 If you want coconut flakes, spread a bunch out on a plate and dip your freshly frosted cupcake into the flakes, they will stick to it beautifully! And there you have it. If you do make these, please come back and leave me a comment about how they turned out for you! I’d love to hear it. If you can’t find a coconut porter like the one Maui Brewing Company makes, you could substitute with some other fun flavor of beer… be creative! Of course you could make these without the beer, but what fun is that?